In the tradition of The Salmon Princess, an Alaskan adaptation of the fairy tale Cinderella, Alaska’s Sleeping Beauty will delight children and adults alike. When the queen of the King Salmon Fishery meets a talking salmon, she is told that a much-wished-for daughter will be born. At the birth celebration, one of the guests makes the pronouncement that the girl—named Alyeska—will choke on a salmon bone and die! But a wise old midwife speaks up to say that the girl will sleep for a long, long time and wake when her time is right. Even though the kingdom is built on salmon fishing, all fish is forbidden from the royal household. Still one day, Alyeska wanders into the woods and discovers salmon being smoked, and she tastes the forbidden food. 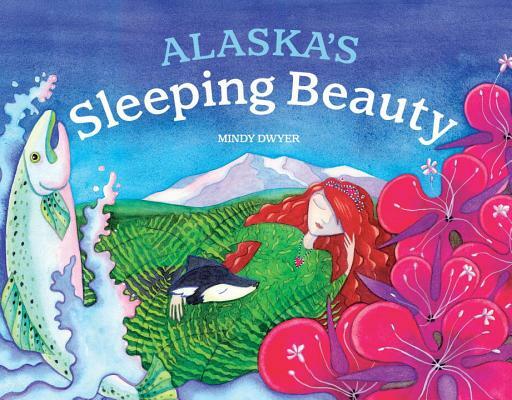 MINDY DWYER is a children’s book author and illustrator who lived in Alaska for many years and now lives in Port Townsend, WA. "Alaska’s Sleeping Beauty is a sing-song tale infused with pride of the North. The book follows the fate of Alyeska, a copper haired princess that falls victim to a sleep-induced spell after choking on a salmon bone. Fireweed, sled dogs, canneries, and smoked salmon—Mindy [Dwyer] transforms it all into a magical world." "All in all, it is a really good story; it is a fairy tale, after all. And there are a lot of real things about Alaska here, too, like salmon and fireweed (a really pretty bright red flower) and panning for gold. The pictures fit perfectly with the story being told. It’s a wonderful, magical story and is very unique." "The kids' current favorite book, out of the hundreds we have is this one... We can not get enough of this book! I think I have read it a dozen times in the last 2 weeks alone. While the story is truly wonderful Mindy Dwyer's illustrations are some of the most captivating & beautiful ones that I have ever seen in a children's book. If you are looking to read a fairy tale that isn't entirely encompassed by Disney this is such a splendid book!" "The illustrations done in watercolors are bright and cheerful and suit the story."